I bet there are few children who haven't played with Fisher Price toys. Since the 1930s the brand has been producing toys and they were an important part of my childhood. I remember playing with the Chatter Telephone, Record Player and Two Tune Television as a child and them being amongst my favourite toys. I've often thought that it would be lovely to share them with my children but those toys are long gone, I've scouted the car boots and charity shops but never found them so, imagine my surprise when Esdevium Games got in touch to tell me about the Fisher Price Retro Classics range! Esdevium Games, the board game manufacturers, are the UK distributors responsible for bringing the Fisher Price Retro Classics range to this country. Basic Fun have recreated a range of products from the golden age of Fisher Price - the 1950s to 1970s which include some of the most well known, iconic toys that parents and grandparents will remember from their youth. I couldn't choose from the range of products available so asked for a surprise parcel. When my parcel opened I was excited to open it and find the Chatter Telephone and Music Box Teaching Clock. This was a perfect combination for us - one is a product that I am very familiar with and the other one was new to me, we didn't have the Music Box Teaching Clock at all when I was small. First, the Chatter Telephone. As you can see from the photo above, we have a Chatter Telephone at home already. The modern version which has been a much loved toy for us. I found it quite amusing when I showed the retro Chatter Telephone to Little Miss as she went to get 'her' phone and brought it to me. It was as if she was saying 'look, the same!' Well they are the same, but different. The Chatter Telephone was introduced by Fisher-Price in 1961, so it celebrated half a century a couple of years ago. 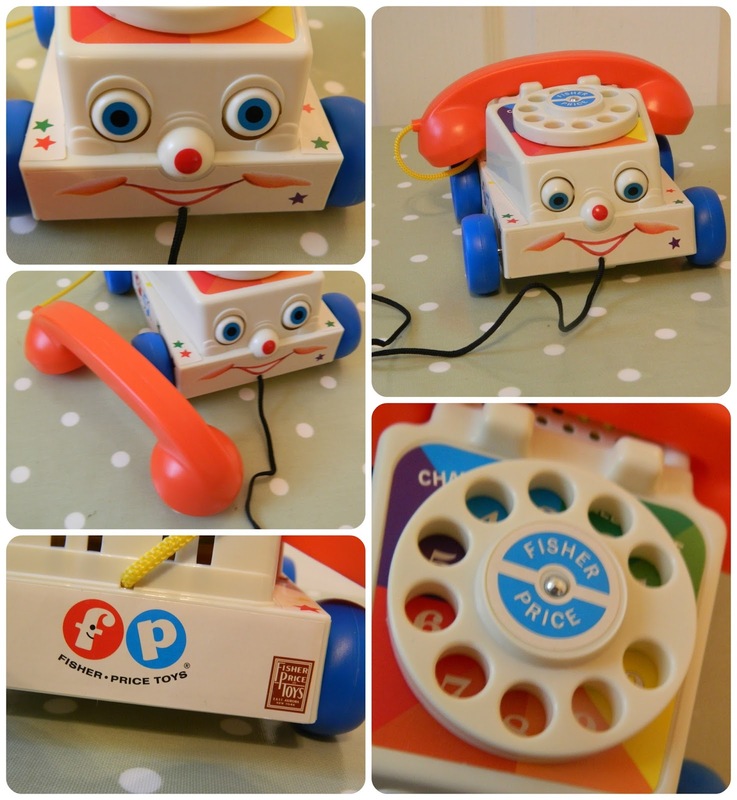 The ringing dial, chatter noise as it rolls and wobbling eyes are exactly the same as I remember them from my childhoood, with the brightly coloured stickers and blue wheels too. I remember loving this toy as a child, it was always a favourite. The new Retro Classic version, while it looks really similar has one significant difference from the one I remember. There's a story in our family about my brother, who is two years younger than me, launching our Chatter Telephone at my head in a fit of pique as a toddler. I can stiil remember how it felt, I saw stars and had a nasty lump, that toy wasn't light! The Retro Classic Chatter Telephone does feel much lighter than our old one so, hopefully, my two won't be recreating that incident! My two were very pleased with the retro Chatter Telephone. I can't help feeling that the Retro Classic version has much more character than the modern day version. It got me thinking about the technology my children are growing up with. I don't think either of my children have ever seen a working rotary dial telephone but they both instinctively know how to turn the dial and that you hold the handset to your ear to talk. I think that, no matter how far technology advances we'll still always give our children telephones that look like traditional phones to play with, and I defy anyone not to 'answer' a phone handset given to you by a toddler! The second toy we were sent was the Retro Classics was the Music Box Teaching Clock. 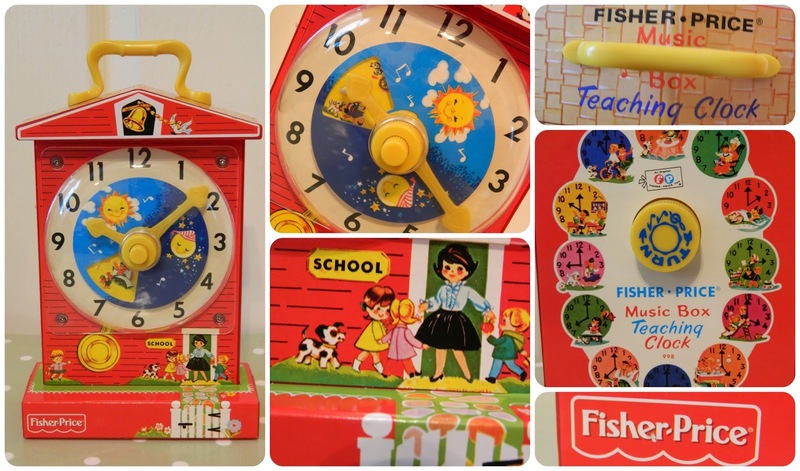 This toy was introduced in 1968 and aimed to make learning to tell the time fun! I can't find a modern day equivalent to this one and we don't actually have any toys which look at telling the time. Bud has a fascination with clocks at the moment but is finding understanding the hours and minutes quite confusing, if you ask him what time it is he usually answers 'four 'o'clock'. The Music Box Teaching Clock comes in the shape of a Grandfather's Clock and is complete with a hanging hook, a dial to wind to play 'My Grandfather's Clock' and a dial on the front which allows the child to change the time. The dial is beautifully decorated and shows day and night. We've been using this toy to talk about what time day and night begin, what time we go to bed and what time we get up. It's a really beautfully decorated toy and, again, significantly lighter than the small Fisher-Price music box I used to own. 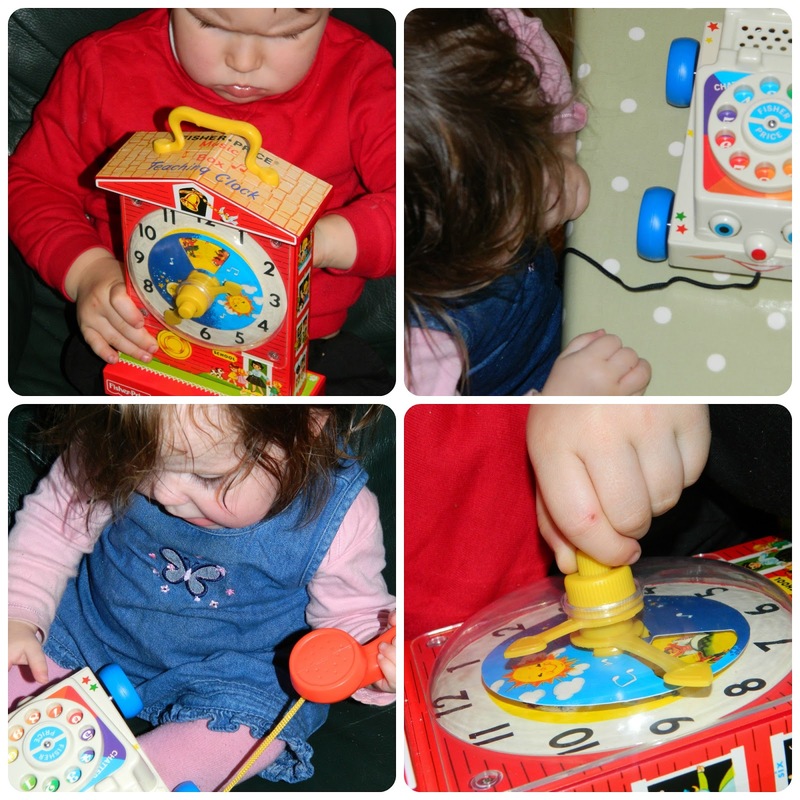 Both Bud and Little Miss love the Music Box Teaching Clock but play with it in very different ways.. Bud is really trying to learn about the hours in the day and is finding it a helpful tool. Little Miss, on the other hand, prefers to play the music and carry it around like a handbag. I love the look of so many of these and it's fantastic to see the variation in what is offered. Buzzy Bee was brought to market in 1950 and is the 'oldest' toy in the range. whereas the Movie Viewer is dated more than 20 years later, it came out in 1973. The one thing that reviewing the Retro Classics range has proven to me is that I don't look back on the toys of my childhood through rose tinted spectacles, the toys were great and did entertain. Seeing my children's reactions to the toys has proven that. The range is a little more expensive than comparable 'modern' toys but the heritage, and the walk down memory lane offered by them is well worth it I feel. 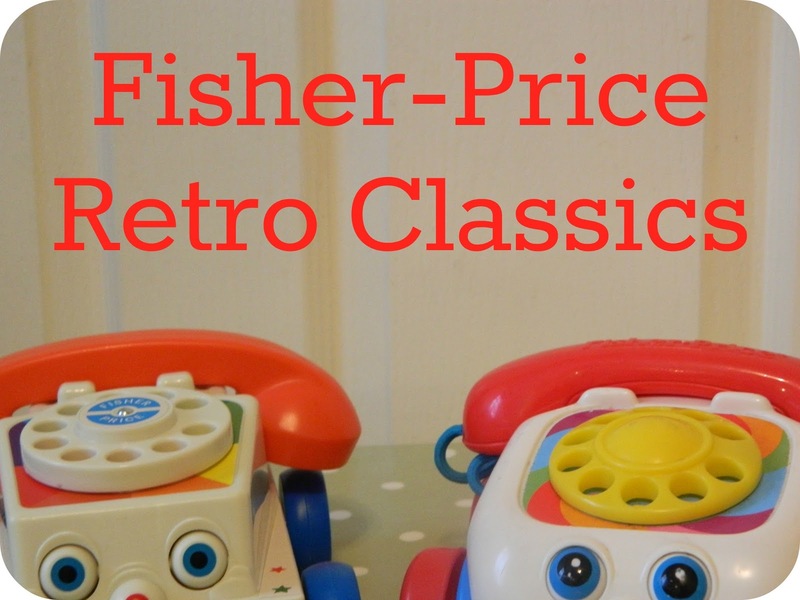 The Fisher-Price Retro Classics range is distributed in the UK by Esdevium Games and is available in a range of stockists including Amazon.